The villa has an amazing pool area, where you and your guests can lounge all day long. The pool is 15 meters long and 1.4 meters deep. Besides the wonderful selection of restaurants in the area, that will serve you food from local produce, and an amazing selection of local wines, we have arranged a special agreement with a local chef, that can prepare food for you at the villa. This has to booked 3 days in advance, so that you can order exactly what you wish. A carefully selected number of restaurants and café’s, can be found in the folder once you arrive to the villa. We are happy to assist in booking those as well, if you so prefer between 2-4pm. The pool is created to give you the best of all worlds. Nothing better to wake up with a morning swim, or an evening dip. The views from the pool are breathtaking. Close to the villa, about a 5 minute drive, you will be able to find a waterpark for those who need more of challenge. The waterpark has a lagoon, two water slides for kids and the grand canyon river. Close to the house we have agreed a special entrance rate for you, and you can book a personal trainer in advance. The gym also has a sauna for the guest to enjoy. 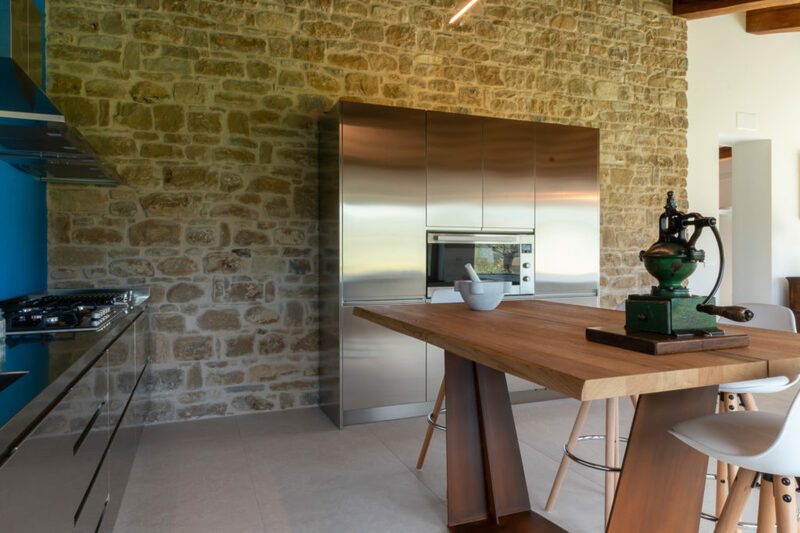 This luxury villa is located in the heart of “Le Marche “ region in the province of Macerata and in the peacefulness of the countryside just outside Cingoli “ the balcony of Marche “ that you can admire from home. 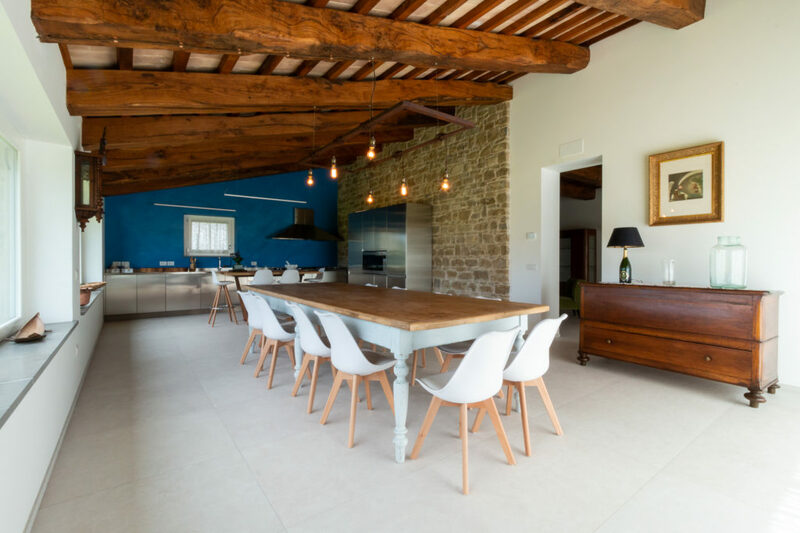 The house itself is located on a small road (newly paved), where every now and then a car comes along and a 100mt private white road allows the guest to reach the farmhouse. 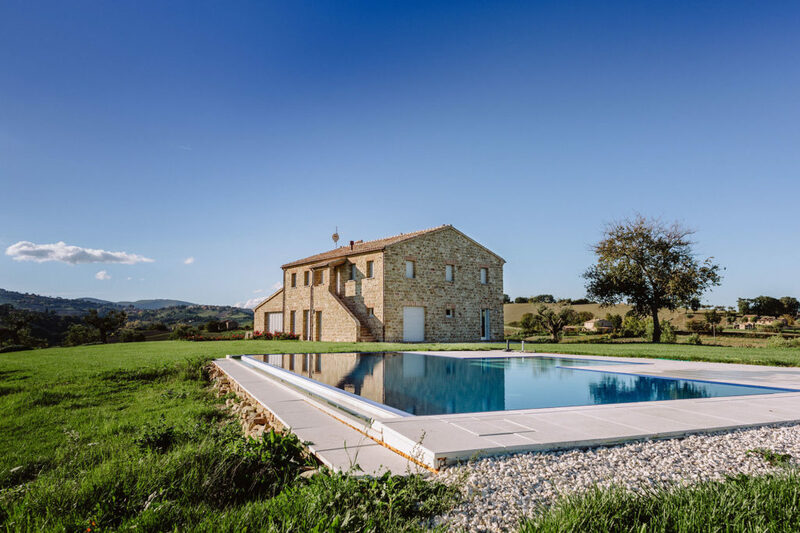 The villa has an enviable position from which to leave visiting the surrounding places, like the old villages and historic town of Cingoli, San Severino Marche, Filottrano and a lot of other historic places. More information can be found in the folder at the villa. The sea with the extensive beaches of Senigallia or the rocky bay of portonovo can be reached in 50 minutes. The Frasassi caves with their incredible natural spectacle can be reached in 40 minutes. The Villa can be reached easily. We can assist with transport, rental cars and everything else that you need to make your stay comfortable. For your convenience we made a special agreement with a rental company at Ancona Airport, who can deliver and pick up the guest rental from anywhere in the area. We can arrange this for you or you are welcome to contact the company directly, as long as you refer that you are a guest of the Farmhouse.